We are fourth year students at the University of Arizona, College of Pharmacy, and we are conducting a research project about your perspectives on your working conditions. We were hoping that you would have time to help us by filling out a brief survey expected to take about 5 minutes to complete. Your answers are anonymous, and we do not collect any personal information. You can exit the survey at any time if you do not feel comfortable completing it. By completing the survey, you are agreeing to allow us to use your responses in our data analysis. For more information about this research project, contact Dr. Richard Herrier at herrier@pharmacy.arizona.edu or 520-626-5240. NCPA has put together its first census to document who you are and what you do. This is your chance to be a part of the bigger story communicated to legislators, regulators, the media and patients. Data from the pharmacy profiles will help NCPA bring new opportunities to community pharmacies. It is critical that as many community pharmacies as possible complete the census. You can take the census on your mobile phone, tablet or desktop computer in just 8-9 minutes. Plus, if you complete the survey by the Aug. 4 deadline, you'll be entered into a drawing for a chance to win one of two $500 VISA gift cards! The drawing is limited to one entry per pharmacy/NCPDP number and the survey must be completed in its entirety. 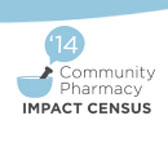 Take the census today and help us support community pharmacy. Available since the 1950s, dextromethorphan can be found in more than 140 different cough-and-cold remedies — both prescription and over the counter. When given for a cough at recommended low doses, usually it is free of serious side effects. But when the drug is taken in higher amounts, bizarre behavior, including hallucinations, is common. Given the effects of DXM abuse, patients are unlikely to present for care before considerable concentrations of the drug have been absorbed from the gastrointestinal tract. A new Centers for Disease Control website capitalizes on the pharmacist's position as the most accessible health care provider to encourage patients to quit smoking. The website, created in mid-June 2014, includes resources specifically geared toward creating a pharmacy-based tobacco intervention program. Content sources include the Office on Smoking and Health and the National Center for Chronic Disease Prevention and Health Promotion. Looking for similar articles? Search here, keyword PHARMACISTS. FedEx Corp., the latest company accused in a federal probe involving illegal online pharmacies, says it will fight the charges that it knowingly shipped drugs to people who lack valid prescriptions. The company says it would have to invade the privacy of customers to stop such deliveries. By contrast, UPS Inc. paid $40 million last year to resolve similar allegations and vowed to overhaul its procedures and work with investigators to detect suspicious activity. Family carers of people with dementia need more help with medication management according to a new report involving the University of East Anglia, which was led by the University of Aston. Researchers interviewed family members who care for loved ones with dementia to find out more about the problems they face. Themes which emerged included medication use and the practicalities of administering drugs, as well as communication problems and a heavy burden of responsibility. Ebola virus disease is sweeping across West Africa in the largest outbreak of the virus to date. Mortality rates are currently at 60 percent in a disease where up to 90 percent of infected people can die. But despite this lethality there remain no licensed treatments or vaccines available, nearly 40 years after the disease was first discovered. Patients soon will have access to a federal report revealing financial ties between their doctors and pharmaceutical and medical device manufacturers during the preceding year. As part of the 2010 Affordable Care Act, federal regulators last year began requiring drug companies and device manufacturers to begin tracking doctor payments and gifts worth as little as $10. An online database of these interactions, including industry-sponsored doctor lectures and meals, will open Sept. 30 as part of the Physicians Open Payments Sunshine Act. A smart contact lens that can monitor the glucose levels in the eye is a step closer to reality, as Google has announced a partnership with Swiss pharmaceutical company Novartis to develop it. The technology giant first unveiled the concept in January, which works using tiny sensors and microchips fitted into contact lenses that can measure and read the amount of glucose in tears, before sending the information to a mobile device so diabetics can manage their condition. Studies supporting the approval of the majority of drugs used to treat attention-deficit/hyperactivity disorder in children were not designed to demonstrate long-term safety and efficacy of the drugs or detect rare adverse events, new research shows. Investigators at Boston Children's Hospital in Massachusetts found that the majority of studies carried out by sponsors prior to market approval of their ADHD drug were either too small, too short or both to extrapolate meaningful clinical gains during longer-term follow-up of children receiving drugs for ADHD. A new formulation of a powerful narcotic painkiller that discourages potential abusers from snorting or injecting the drug has been approved by the U.S. Food and Drug Administration. Called Targiniq ER and made by Purdue Pharma, the pill is a combination of the narcotic oxycodone and naloxone, a drug that blocks the euphoric effects of oxycodone. The naloxone is only activated when the pill is crushed, snorted, dissolved or injected, according to the FDA. FDA recently announced the approval of idelalisib oral tablets for the treatment of three types of blood cancer that have relapsed after previous therapy. Labeling for the drug, which Gilead Sciences Inc. is marketing as Zydelig, states that it is intended for the treatment of certain patients with chronic lymphocytic leukemia, follicular B-cell lymphoma or small lymphocytic lymphoma. The Food and Drug Administration is reviewing research data on what could become the first U.S.-approved "biosimilar" drug, a cheaper, sort-of generic version of a biologic drug. Nearly five years after Congress passed a law enabling future approval of biosimilars, for the first time the FDA has accepted an application to sell a similar, but not identical, version of a biologic drug.